Back pain. If you’ve ever experienced it, you know how it can completely throw a wrench into your daily routine. You may have lifted something improperly, and suddenly you can barely stand up straight let alone walk around. Perhaps you’ve suffered from chronic back pain, and you can no longer do the activities you enjoy. Whether your pain is chronic or acute, you’re aching (pun intended) for relief! Back pain is a general term that people normally use for any type of discomfort in the back or spinal region. This can include tense muscles in the upper back, which can sometimes improve from a simple massage. A more specific and localized type of back pain is called Sciatica. Sciatica is the proper medical term for pain that exudes from or along the sciatic nerve. The sciatic nerve extends from the lower back all the way down through each leg. Usually those suffering from sciatica only experience pain on one side. There are a few common causes of sciatic pain, including bone spurs, herniated discs, and pinched nerves from a narrowing of the spine. Some pregnant women experience sciatica when the position of the fetus causes a pinched nerve. Other types of lower back pain that aren’t a result of a compressed sciatic nerve are usually related to the muscles. If the muscles in the lower back are tight, strained, or pulled, it can lead to lower back pain. Sometimes back pain is so excruciating that people find it hard to find any comfortable position. The good news is that sciatic pain typically resolves on its own between four and six weeks. But four to six weeks can be a very long time to live with such debilitating pain. Luckily, there are some home remedies and exercises that you can try at home to relieve lower back pain. Tennis ball therapy has been shown to reduce lower back pain by working the piriformis muscle, which is located in the posterior pelvic region near the sciatic nerve. You can do this therapy from your own home. Start by sitting or lying on the floor and placing the ball on or near the muscle where it feels that the pain is originating from. You can use one or two balls to do this. Using two balls generally works a larger area with less pain, since the pressure is distributed over two balls; however, you may find it easier to start by working with one ball until you get the hang of things. Slowly move your body so that the ball is moving around the muscle. 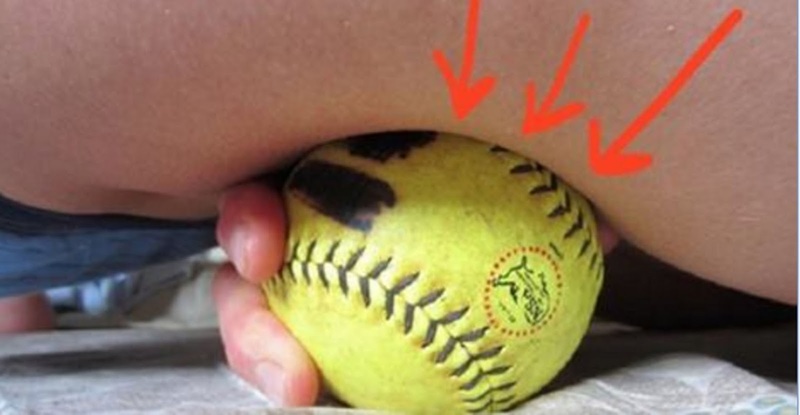 Note any tender spots and compress the ball on these spots for 15-20 seconds. Doing this a few times per day will help to ease tension in the muscle and hopefully take pressure off the sciatic nerve. Another lesser-known remedy for lower back pain is spicy food. The capsaicin found in peppers likechili peppers, jalapenos, and habaneros helps to ease inflammation, which may in turn take the pressure off the sciatic nerve. It is important to remember that sciatic pain is a symptom, not a cause or disease in itself. It is important to find out if the sciatic pain is due to a bone spur or herniated disc, as these may require more treatment. If, however, your sciatic or lower back pain is due to a muscle or pinched nerve, tennis ball therapy should do wonders to get you back on your feet. This post was republished from positivemed.com. You can find the original post here.